Properties in Knox County average 4.7 out of 5 stars. New secluded cabin. Quiet, Private drive. Property 7: New secluded cabin. Quiet, Private drive. Cozy Cottage - Minutes from Attractions! Property 12: Cozy Cottage - Minutes from Attractions! 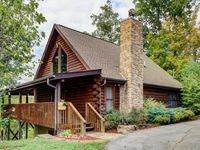 Property 18: Sevierville Resort Cabin w/Patio, Porch & Hot Tub! Property 24: Custom Sevierville Log Cabin w/Spa - on 10 Acres! Property 32: Declan's View - Cozy 1 bedroom with Game room and Great Mountain Views! Property 39: April Sun-Thurs Stay 2 nights get the 3rd Free! Weekdays only. Property 41: April Sun-Thurs Stay 2 nights get the 3rd Free! Weekdays only. Special!! $85 per night (plus fees), except for Holiday weeks!! Property 47: Special!! $85 per night (plus fees), except for Holiday weeks!! Property 48: April Sun-Thurs Stay 2 nights get the 3rd Free! Weekdays only. I was in the area with a coworker of mine for a week long class, we didn't really want to stay in a hotel so I lucked up when I found this little gem. I do not know where to start, but this place is amazing! The views, the tranquility, the amenities...the list is endless. The owners are very welcoming and will help answer any questions you have. I most definitely will visit this beautiful place again and I highly recommend it even if it is just for a weekend getaway. There were several other nearby cabins, but we felt all by ourselves. The cabin was very comfy and clean. We enjoyed sitting in the hot tub and looking out at the countryside. There's absolutely no noise out there. The only problem that I had was getting off the couch. The seats reclined, which was good, but the springs were wearing out, which made getting into a position to put the footrest down difficult. My grandson loved watching my struggles and looked forward to it so much that he'd sneak up on the side and move the lever to make the footrest go up. Everything was comfortable until I tried to get out of there. I'd try to get a grip on the right armrest, push up, and roll to the left, then kneel on the floor and push up. Oh well, it's a great memory for him. I would thoroughly recommend this cabin. Word of advice--allow plenty of time to get to town. These mountain roads take a bit longer to travel.